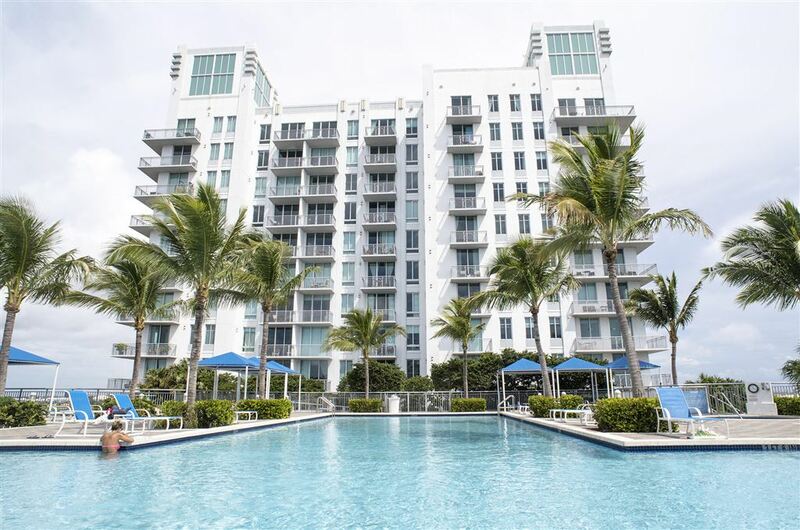 The Edge is an exceptional waterfront condominium building offering incredible views of Clear Lake, downtown West Palm Beach, the Intracoastal Waterway and the Atlantic Ocean. Built in 2007 by renowned development company, Wood Partners, The Edge is comprised of 307 loft-style condominium units all beautifully appointed and designed to achieve luxurious and modern living spaces. From the floor-to-ceiling impact resistant tinted glass, to the sleek kitchens and porcelain tile flooring, to the exposed concrete ceilings and open floor plans with 10-foot ceilings, The Edge condos are truly a masterpiece. The kitchens in The Edge condo units are complete with top-of-the-line stainless steel appliances, granite countertops, contemporary wood cabinetry, full-sized washers and dryers in all units, recessed lighting, and oversized bathtubs. At The Edge, each public space has been designed to feel unique and comfortable while providing all the opportunity you need to rest and rejuvenate. The grand lobbies feature 16-foot high ceilings, stunning artwork, and designer furnishings. The Edge is attended 24/7 and offers controlled entry for security, only granting access from the exterior. All units at The Edge have been equipped to accommodate multiple phone lines, wireless technology, and Wi-Fi is even offered in the lobby and amenities deck. The Edge offers twenty-two unique floor plans, ranging in size from 650 square feet to over 1,700 square feet of air-conditioned space. These "soft-lofts" range from cozy studio and one-bedroom floor plans, to a well-appointed two bedroom-plus condos and townhomes.